What is “MoLZ?” MoLZ is Music over LaserZ and it is exactly as it sounds…transmitting music (really, any kind of audio) using a laser. This, is Toshio Iwai, an interactive media artist. He is probably best known for his work in non-traditional musical interfaces. He is also responsible for the Tenori-On which was his attempt at creating a new musical instrument which, from what I can see, is used pretty widely by many artists like Little Boots. Over the course of his career (which continues on today), he has made some really neat things from a computer game (Otocky) to media art installations. 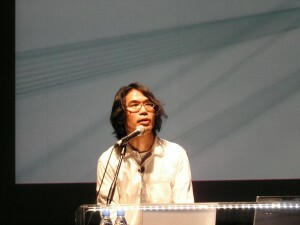 Iwai also was an artist in residence at the Exploratorium in San Francisco.